Palm/Passion Sunday Worship Service – Sunday, April 14, at 9:30. Journey through the last week of Jesus’ life. Begin with his celebratory entrance into Jerusalem and end with his death on the cross five days later. A combination of music, slides and readings helps the entire congregation participates in the story of those final days. Good Friday Worship — Friday, April 19, at 7:00 pm. We will walk with Jesus’ through his trial, condemnation and crucifixion. There will be songs, readings, and hands-on experiences. We will continue to look at the Cross Walk theme and explore what Jesus’ death means for us today. 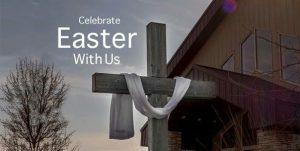 Easter Sunday Services — Sunday, April 21, at 9:30 and 11:00. We celebrate the victory over sin and death on Easter morning, as God raises Jesus to new life. Both the 9:30 and 11:00 services include joyful worship celebrations, as our praise band is supplemented with brass and a choir. All of these services are wonderful opportunities for people to encounter God through different worship styles and new experiences. Please invite your friends and family to come and meet God at Cross of Glory during Holy Week. Contact the COG office if you would like to help with any of our Holy Week services.